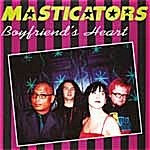 In Music We Trust - Masticators, The: "Boyfriend's Heart" b/w "Fine Afternoon"
Okay, what do you get when you cross France's coolest record company with the City of Angels' great white hopes and even a great lost Cheepskates song? Why, you get the grand new Pop The Balloon single from The Masticators, written by Shane Faubert of course! This, along with the dizzyingly Curt Boettcher-esque "Fine Afternoon" (from the pen of Lisa Mychols Herself) on the flip, provides a double-whammied, full-dimensionally stereophonic, sensational stopgap-of-sorts ...until that second complete Masticators long-player itself gets mixed, manufactured and duly marketed, that is. Master P: MP Da Last Don Masticators, The: Masticate!